What can human bones tell us of a person's life, or even death? How can information from bones solve mysteries both modern and ancient? And what makes the study of skeletonised human remains so imperative in southern Africa? The answers to these and other questions are contained in Missing & murdered, which lays bare the fascinating world of forensic anthropology. 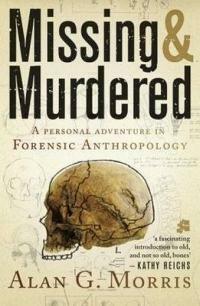 As the popularity of TV programmes such as the CSI trilogy and Silent Witness attests, people are fascinated by forensic science as a means of solving crimes, and in this book Alan G. Morris follows the pathway into forensics via the fields of anthropology and anatomy. He makes the practice of forensic anthropology, the skills base of skeletal biology and the study of archaeological skeletons hugely accessible to the layperson in a series of fascinating cases, from muti murders and political killings to the work of the Missing persons task team. I really quite enjoyed this. Especially after Byleveld and Catch Me a Killer ... I think this is a good read if you are considering studying something like this because it is very clear just how romanticised the TV versions we get exposed to actually are. It is so refreshing to read the true-life versions, and even more so the ones that are happening on our doorstep.